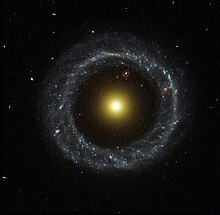 Hoag's Object, a ring galaxy. Another red ring galaxy can be seen behind it. Vela ring galaxy, and a bright star known as HD 88170.